The Paris Hotel Las Vegas is one of the more unique hotels on the Strip. Once you enter the complex you are transported to the elegance of French culture. The French architecture is easily spotted within the Paris Hotel Las Vegas where the lobby is a smaller version of the Palace of Versailles; walkways are lined with cobblestone, a half scale replica of the Eiffel Tower stands 46 stories tall and there is even an Arc de Triomphe. The rooms are standard size with French décor and the suites are fashioned after the best of French luxury. The casino will remind you of Monte Carlo with the Eiffel Tower standing guard above. The octagon pool is surrounded by lush gardens and the Paris Spa by Mandara will rejuvenate your spirit. 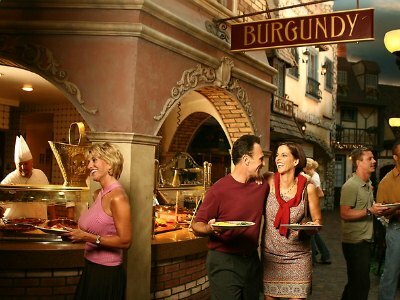 The Paris Hotel Las Vegas offers a great selection of restaurants including acclaimed Chef Gordon Ramsay’s Steak and Le Village Buffet is like visiting a French market. 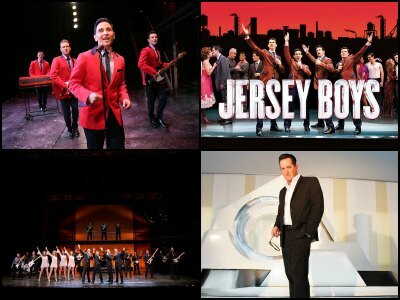 The long running musical Jersey Boys highlights the exciting entertainment. The shopping on Le Boulevard features spectacular retailers like Swarovski and smokers can indulge at the David Boutique. The highlight of the complex is the Eiffel Tower. Glass elevators will take guests above the Strip, where they will find a 360 degree panoramic view of Las Vegas on the observation deck. At the end of the day patrons can dance the night away at Chateau and the Rooftop that sit conveniently under the tower. 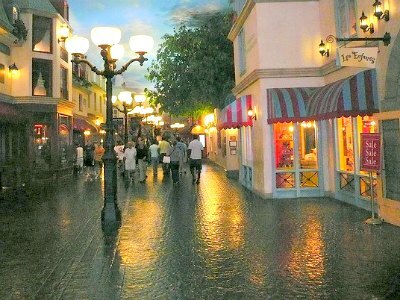 The Paris Hotel Las Vegas has almost 3,000 rooms and suites that have a French themed décor. There are two types of standard rooms at the Paris Hotel which are the Classic and Red Rooms. The Red Rooms were all remodeled during 2009 and sport a more modern French décor. Each of these rooms has 390 square feet of comfort that offer a king or two queen size beds. The room includes such amenities as a work desk, small table with chairs, refrigerator and a bathroom that has a tub/shower combination with a vanity. These two types of rooms also are available with a variety of views from the Strip to the Eiffel Tower. These rooms are available in smoking or nonsmoking options as well as for people traveling with pets. The suites at the Paris Hotel Las Vegas vary in size from 700 to 3,400 square feet and each suite has a different view of the Strip or the Eiffel Tower. The Classic, Classic Red and Lemans Suites are the smallest with a separate living area with furniture, dining table, work area, refrigerator and a wet bar. The king size bed is accompanied by a bathroom with a whirlpool tub, walk-in shower, makeup area and a dual sink vanity. Each of these three suites can have an additional bedroom connected and there are selected Lemans Suites that are pet friendly. The Deluxe Suite varies from 860 to 1,000 square feet with a separate living room with a dining table, furniture, refrigerator, work desk and a wet bar. The bedroom has a king or two queen size beds and the bathroom includes a whirlpool tub, walk-in shower, dual sink vanity and a makeup area. The Deluxe Red Suite has 720 to 945 square feet with a separate living room that includes a dining table, furniture, refrigerator, work desk and a wet bar. The bedroom contains a king or two queen size beds and the bathroom has a dual sink vanity, makeup area, private dressing area, whirlpool and walk-in shower. The Nice Suite is 1,140 square feet has a separate living room, a dining table, furniture, refrigerator, work desk and a wet bar. The bedroom has a sitting area with a king size bed and the bathroom has a dual sink vanity, whirlpool tub, oversized shower as well as a makeup area. The St. Tropez Suite is around 1,500 square feet with a separate living room that includes a work desk, dining table, furniture, refrigerator, work desk area and a wet bar. The bedroom has a king size bed with a sitting area and the bathroom sports a dual sink vanity, whirlpool tub, makeup area and an oversized shower. The 1,000 square feet Charlemagne Suite has a separate living room that includes a dining table, furniture, refrigerator, work desk area and a wet bar at the Paris Hotel Las Vegas. The bedroom has a sitting area with a king size bed and the bathroom includes a whirlpool tub, makeup area, dual sink vanity and an oversized shower. The Marseille Suite has two bedrooms and over 1,500 square feet with a living area that has a dining table, furniture, refrigerator, work desk space and a wet bar. Each bedroom has a king size bed with a bathroom that includes a dual sink vanity, whirlpool tub and walk-in shower. The Louis XV Suite is 3,300 square feet with two full bedrooms and an elegant French Revolution decor. The living room contains a formal entry area, dining table, coffee maker, refrigerator, work desk space, baby grand piano and furniture for entertaining. There is also a separate den that features a wet bar. The bedrooms have a king size bed and the bathrooms include a dual sink vanity, whirlpool tub, makeup area and a walk-in shower. The Napoleon Suite is similar in size and amenities as the Louis XV with a third bedroom. This is the perfect suite when you are looking to sprawl out with family or friends in a fabulous French décor. The entertainment presented by the Paris Hotel Las Vegas is highly acclaimed and includes the magical talents of Anthony Cools as well as the Broadway musical Jersey Boys. The Jersey Boys has been a hit musical around the world and has become a Las Vegas favorite. The Jersey Boys outlines the career of Frankie Valli and the Four Seasons which began in the early 1960s. The show highlights the ups and downs of these childhood friends as they make their way through the music industry. The choreography is spot on whether performers are dancing, singing or being melodramatic. The singing of Sherry and Big Girls Don’t Cry will leave the audience with a surreal feeling of being on the Atlantic Seashore. Anthony Cools has a delightful mixture of hypnosis and comedy during his 90 minute performance. Anthony is a mastermind of deceitful comedy as he moves around the room looking for his next audience victim to hypnotize. Anthony taps into the inner spirit of people not only with hypnosis but with comedy too. Many guests are quite amazed by their hypnotic actions and sometimes a little embarrassed by their movements while hypnotized. 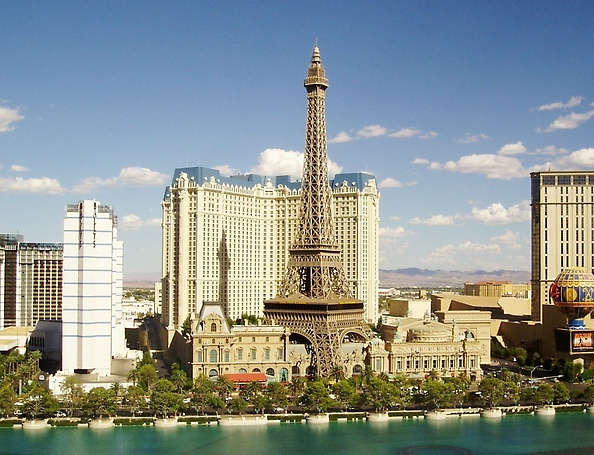 Paris Hotel Las Vegas has all of the nightlife that you would expect with European charm. There are seven primary bar, lounges and nightclubs located within the complex that include Le Central for the perfect martini; Le Cabaret boasts a garden style area that features DJ’s and live music; there are dueling pianos, premium cigars and champagne at Napoleon’s Lounge; Le Bar du Sport is the ideal place for a beer while watching the big game and Gustav’s boasts plenty of signature drinks under one of the legs of the Eiffel Tower. 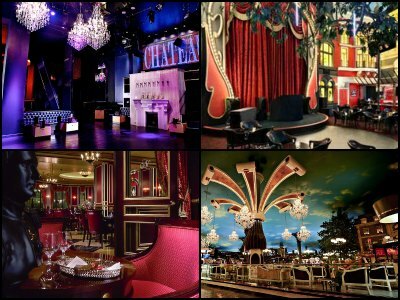 For those guests wanting a unique nightclub experience there is the Chateau with an elegant décor and the outdoor Rooftop Nightclub lets guest dance under the stars as well as the Eiffel Tower. The casino at the Paris Hotel Las Vegas is an 85,000 square feet area with European décor that is accented by the lower legs of the Eiffel Tower. The casino has 100 table games that include favorites like roulette to blackjack to craps to baccarat. There are plenty of poker tables offering games like Three Card Stud and Texas Hold’Em. Plus there is the Salon de Tables that boasts high limit games. 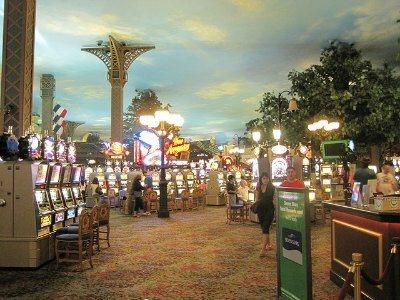 There are over 2,000 of the newest slot and video poker machines for enjoyment. The race and sports book area offers comfortable seating for 356 guests with numerous personal betting stations and televisions for guests. The Paris Hotel Las Vegas has one of the most innovative buffets in Las Vegas. Le Village Buffet is fashioned after five regions within France and includes live cooking stations with cuisine cooked to order. Guests will be pleased with the new French twists placed on all of your favorite American buffet classics. Le Village Buffet is beautifully decorated with accents of Europe everywhere. Patrons will be satisfied whether they want crepes for breakfast, an incredible salad bar at lunch or the perfectly prepared prime rib at dinner. The assortment of French cheeses and the fabulous Vanilla Bean Crème Brulee are must eats. Le Village Buffet also offers a French styled brunch buffet on the weekends. 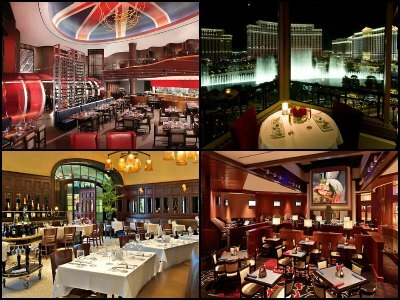 The dining at Paris Hotel Las Vegas brings many flavors for different budgets to the table. The Café Belle Madeleine serves bistro style sandwiches, pastries as well as a variety of coffees, and guests can find delicious crepe dishes at La Creperie. There are many choices on the casual dining side including Le Village Buffet when your group needs a large selection of cuisine; the Burger Brasserie inserts a French twist on sports bar favorites; the HEXX Kitchen and Bar serves up American favorites 24 hours a day; JJ’s Boulangerie offers pizza, sandwiches and fresh salads; indulge in cuisine from Asia at the Yong Kang Street Dumpling and Noodle House; Le Café Ile St. Louis boasts the tastes of a French sidewalk café and the Mon Ami Gabi has traditional steak frites. For guests looking for upscale dining there are French classics prepared by Chef J. Joho at the Eiffel Tower Restaurant; the perfect steak awaits patrons at Gordon Ramsay Steak and Chef Steve Martorano prepares his innovative Italian cuisine at Martorano’s. 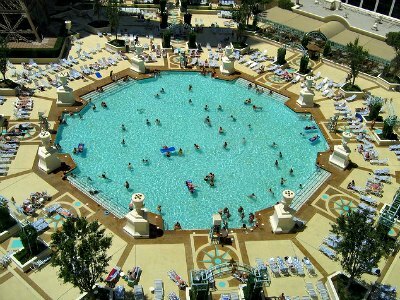 The Soleil Pool at the Paris Hotel Las Vegas is one of the most interesting pool areas in Las Vegas. This two acre paradise is situated under a towering replica of the famed Eiffel Tower and will remind guests of a finely manicured garden in Paris. There is plentiful space around the octagonal pool for patrons to enjoy. The Soleil Pool area also has cabanas that boast an incredible VIP experience poolside. Guests can indulge in poolside cocktails and cuisine from the adjacent Café du Parc while playing in the pool or in one of the two Jacuzzis. 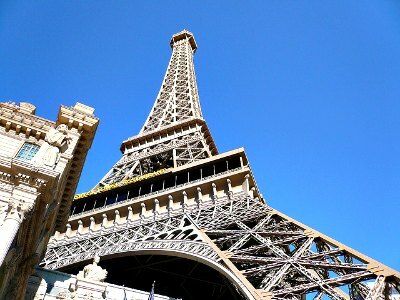 There is a must-see attraction located at the Paris Hotel Las Vegas which is the replica of the iconic Eiffel Tower. The Eiffel Tower Experience can only be described as fascinating. The tower has been recreated to a half scale replica of the original structure that stands majestically over Paris. Glass elevators transport guests 46 stories in the sky for a 360 degree panoramic view of the Strip from the observation deck. Patrons can enjoy a wonderful romantic French cuisine dinner on the 11th floor at the Eiffel Tower Restaurant and couples can even have their wedding ceremony performed on the observation deck. 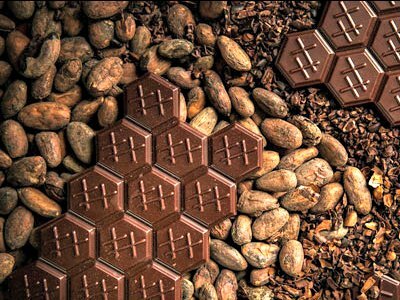 Another fascinating attraction at the Paris Hotel in Las Vegas is The HEXX Chocolate and Confexxion. It is an ideal stop for the person that is looking to cure their sweet tooth. Guests are invited to watch while chocolate experts mix and match wonderful cacao beans to create the ultimate chocolate tasting experience. Patrons can taste everything from single origin chocolate to specialty ice cream sandwiches. There is also plenty of chocolate that guests can take home with them to create their own chocolate tasting party in their home. 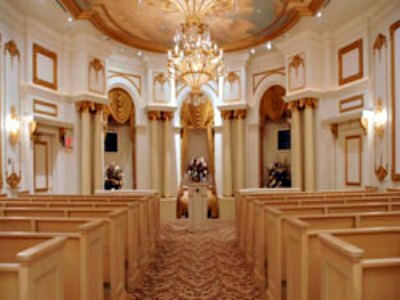 The Paris Hotel Las Vegas has three unique locations on the complex for weddings. The Chapelle du Paradis has a traditional cathedral decor with accommodations for 90 guests; the Chapelle du Jardin has a modern décor with seating for 30 patrons and the Eiffel Tower Observation Deck will take couples as well as 12 guests 460 feet above the Strip for a never ending view. The Paris Hotel has several packages as well as expert wedding planners to help make your wedding day something to remember forever. The Paris Spa by Mandara is a tranquil space located on the second floor of the Paris Hotel Las Vegas. The interior is peaceful with flowers, light wall colors and a contemporary decor that incorporates a South Pacific feel with European style. The Paris Spa by Mandara offers separate facilities for both sexes that include specialty items like heated whirlpools, Eucalyptus steam rooms and cold plunge pools. 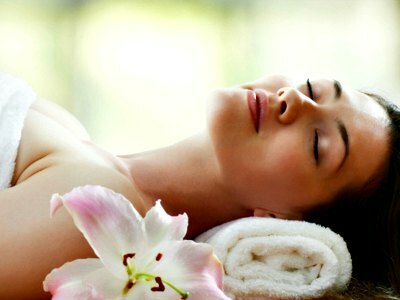 There are six private treatment rooms that offer plenty of unique treatment packages like the Thai Herbal Poultice Massage or the luxurious Elemis Exotic Coconut Rub and Milk Ritual Body Wrap. The Paris Hotel Las Vegas boasts a very unique shopping area that will remind you of walking down a quaint street in Europe. Le Boulevard has a décor of a bustling street in Paris along with cobblestone streets that are packed with unique retailers. Shoppers can browse luxury brands like Swarovski for that perfect crystal; smokers will delight in the cigar selection at the Davidoff Boutique; Perfume de Paris has all your favorite aromas in cologne and perfume; Optica has the latest fashions in eyewear; Glitz to Go boasts trendy jewelry and accessories; Travel+ has the newest travel and vacation equipment; Jersey Boys Boutique has all of the memorabilia from the acclaimed stage show; Misura carries men’s apparel in brand names like Hugo Boss and Donald Pliner; women can find exquisite clothing from evening dresses to handbags at the Paris Line; Les Elements has the perfect European home décor gift; La Cave boasts fine French cheeses, wine and gourmet food baskets and the Eiffel Tower Shop offers many iconic souvenirs of this special structure. There are also three souvenir and sundries shop which are Les Necessites, Presse and Le Journal.